Life is usually composed of ups and downs, pros and cons, pluses and minuses. And such has been my experience recently. Let’s start with the downs first: my car seems to have decided that now is the time for a major overhaul. It’s 7 years old, and I’ve been lucky to get by with standard oil changes and check ups until now. Lately, all systems seem to be flaky. Last time I posted, the car was non-operational due to a dead battery. That required a tow from my garage to a mechanic’s garage before the repair could be made. The grand total so far is roughly $700. And let’s not forget that airbag light. We still haven’t addressed that, since the part to fix it will be almost $500, plus tax and labor. I’m putting that one off until next month. Oh, and one of the tires has a nail/screw in the sidewall that so far is causing no problems, but could result in a flat tire at some time if not addressed. OK, so that’s the bad stuff around the car. Now, on to the bad stuff around my house. So far, all the mechanicals in the house are working well. But that pesky raccoon came back this morning. I was roused from sleep at about 5 AM this time by the squawking hens and found the raccoon INSIDE the run this time. Yep, it had found a way around the bird netting and was sitting in there fairly calmly as the hens went wild with fear. Stupid me had not locked the run to the Eglu, so the hens were fair game for this predator, even though they have been sleeping in the Eglu coop (which is located inside my bigger, walk-in run) at night instead of on top of the Eglu. So, I rush out to find the raccoon in one corner of the run sitting in a seemingly calm manner, while the hens were in another corner of the run panicking. I’m lucky this raccoon seems to be young, inexperienced, and easily intimidated. It gladly tried to climb out of the run when I used the blustering technique again [pounding on the fence and sternly yelling “get out of here; go!”] This time the escape took longer, as I have the bird netting on top secured well in *most* places. Not all places, however, as I saw the beast try several escape options before it finally succeeded. Well, now I know where to reinforce, I guess. So, the two bad things lately involve costly car repairs and hen predators. Now for the good stuff that is helping to balance this out. I have new roommates. Yep, just tonight roommate #1 has moved in upstairs. The second person will be moving in slowly over the next month; he’ll be moved in completely by November 1, but until then has paid October rent and a security deposit. Note the pronoun: he. Both of my new roomies are guys. When I think of it, what runs through my mind is “I’m living with boys,” in a silly, giggly voice. There were several folks interested in my posting on Craigslist — many of them women — but these 2 students seemed to fit well. They’re only 25 years old, but they both work and go to college. One is finishing his bachelor’s degree this month and then starting on grad school, while the other is in this last year of undergrad. Their references checked out very good, and they seem to have their acts together. I think it will be good for me to live with a couple people who can give me a different perspective on things. I’m really looking forward to this new adventure. And, the fact that I got two month’s rent so far — a one month security deposit and rent for October — has really helped at a crucial juncture. Heck, these guys just paid for this month’s car repair bill. Thank goodness for life’s little balancing acts, eh? I’m giving fair warning here that this is a very whiny post. So pass it right by if you don’t want to deal with it. I need to vent and this is my blog so I can write what I want. It seems like I’ve been having a string of bad luck for months now and it’s very annoying. I’ve had good things happen, too, like having a very relaxing vacation at Esalen and getting an actual raise this year when many folks have had to do without any salary at all. But it’s true that many bad things have happened. In May, the washing machine died. Yes, it was 18 years old and had been doing odd things for many months, but dying just before the major expense of a kitchen remodel started was rather hard to swallow. In July, the 4-year old vacuum cleaner went kaput. I had to buy a new one right away since I was nearing the end of the kitchen remodel and there was dust everywhere. Last week, I came home to find a $100 red light ticket in the mail. As much as I would like to fight it and prove that the city is wrong, I’ve viewed the video online and I’m clearly driving through the intersection as the light turns red. I must have been driving in my sleep in the middle of a Sunday afternoon, but clearly I ran the light so I must pay up. Tonight, my 7-year old car died. I’m sure it can be fixed, and luckily it did not strand me by the side of the road in some awful neighborhood. It was sitting in the garage and when I got in it to drive to my friend Betsy’s place for dinner it just wouldn’t start. All the dashboard lights came on and stayed on, but the car wouldn’t turn over. It didn’t even try to turn over. When the car wouldn’t start, I called Betsy to alert her that I’d be delayed and then took the CTA to her house. My CTA karma was quite good tonight since the bus pulled up within a minute of me getting to the stop and the el arrived right after I made it to the platform. At least something was working well for me today. Overall, though, it seems like I’m just having the shittiest luck these days. I know there are plenty of people out there in worse situations than me. I’m glad I actually have the resources to fix the car, although it may mean pulling money from one of my savings accounts (do I dip into the emergency fund for this or do I dip into the vacation fund I just started to save for a trip to Europe next year? Hmmm…). I think what really hurts me about this situation is when I talk to friends about it and they scoff at my protestation about how much this is going to cost me or my comments that I need to tighten my belt a bit more. Why must I be near destitution to get some compassion? Isn’t it obvious that I have been struggling to adjust to a single-income lifestyle for the past few months? I really don’t want to sell my house because I’ve put so much into it, but I also don’t want to be living paycheck to paycheck or with no luxuries at all. I try to be frugal in many ways, but hear scoffing from some of my friends about my measures. Yes, I know I’m not poor and that there are folks worse off than me, but I’m really trying to make a major lifestyle change here. Please be supportive of me when I say I’d rather make something to bring on a visit to your house than buy a bottle of wine. Please don’t scoff at me when I say that I can’t go out to dinner or meet for a drink or that it hurts my financial plans to spend money on fixing the car. I guess since I have a good job and a good income I’m not worth any sympathy. But after several years where it seemed the joint (married) bank account just kept growing and growing and growing on it’s own, I find it quite a change to try to figure out where I should make lifestyle changes so I can save money for vacation or afford to buy some new clothes for work or tailor some old suits to wear at the office. My goals are to be able to pay my bills, save at a steady pace for major expenses like a big vacation, and have a regular splurge once a month on something like a fancy dinner out, a yarn crawl, a wardrobe adjustment, or a cheap weekend trip. All without going into debt. Tomorrow I have to walk to the mechanic at the corner and find out if they can help me get my car out of garage and fix it. I’ve used this mechanic for an oil change once before, but other than that I don’t know much about them. So I hope they are honest and know what they’re doing. I guess I’ll find out. Sometimes it’s just scary being on your own with no back up. I guess that’s what upsets me most of all. I just keep riding the waves and telling myself it will get better soon. The day is not yet over, but I need a break from chores so I thought I’d write a bit. I slept really poorly last night (damn pseudophedrine really works for cold symptoms but takes forever to get out of my system), but was still up fairly early so I could tackle my To Do list. I’ve been cruising through the weekends with plenty of down time, and I couldn’t keep doing that. If I want to get a housemate to help pay some of the mortgage I really need to get cracking on clearing all the stuff out of the second floor. But even that had to wait as I ran out to get supplies for a project that I just can’t put off any longer: reinforcing the chicken run. I needed 1/2-inch hardware cloth and lots of it to complete the “inner ring” of security. I had a few things to return to Home Depot, as well as a few odds and ends to return to a local department store. The returns are important here as I’m trying not to incur a lot of costs for the next couple months until I get some of the excesses paid off without having to dip into savings. (Yes, I know that yesterday didn’t help, but I do have a solid plan to make sure those expenses are covered.) Luckily, all of the returns added up to about the same as I ended up spending at The Depot on hardware cloth. That stuff is expensive! Before I left the house to run errands I watered the veggie garden, hooked up the soaker hoses to front and back, and vacuumed all the floors. This is important because I RIFed the cleaning lady today. I felt bad about it, but I need to conserve funds and that’s an easy way to put a good amount of money back into my budget. I figure if I do a little bit of cleaning throughout the week, it won’t be so bad. I lived for many years in an apartment not much smaller than the space I’m living in now and was able to keep it clean and tidy on my own. So, I should be OK.
After the errands I did a little work in the kitchen to prep some food. I set the bread machine to baking a loaf of honey wheat bread, and put one of the rabbits I got from Andrew and Misty into the slow cooker. I’m making up a Morrocan inspired recipe with chopped fresh tomatoes, onion, raisins, olives, cinnamon sticks, and a bit of orange juice. I hope this tastes good. I’m glad I took the time to prep the food or I would be eating frozen pizza tonight. Attaching all that hardware cloth to the inside of the chicken run is no fun. The hardware cloth seems to want to fight you the whole time, and I’m sure I have scratches in several places from it. But the work is done! I really needed about 2 more feet of hardware cloth, but I was able to fill in the gaps with some strategically placed landscaping bricks. I also stapled the bird netting much tighter along the fence, making it more difficult for the sparrows to sneak in that way to steal food. I’m tired and dirty, still sick, and sort of overwhelmed now, but I know I’ll settle down soon. The overwhelm is a feeling that I’m sure will pass soon. It’s just that there is so much to do to take care of this place and I’m on my own with the chores. There’s plenty of weeding to do, and I could certainly do some more housecleaning, but I won’t do that tonight. Instead I need to do a few things for work before I can clean up and relax. And it’s really sinking in that I need to make some changes to my lifestyle if I want to save money for things like travel. Until I get a housemate, that is. I *really* want a good housemate. So that’s the next big project: finish prepping the upstairs and find a housemate. Not something that can be done overnight, but a worthy project to keep me busy as the garden winds down for fall. I nearly resorted to buying eggs this week. The poor hens have been so discombobulated by the raccoon visit that they still are not back to a regular laying cycle. After the “misfires” in the days immediately following, I was finding nothing in the nestbox most days. A week has passed and I’ve gotten only 2 eggs: one today and one on Wednesday. I had planned to bake some chocolate zucchini bread this week, but I’ve held off because I don’t want to use up every egg in the house. And if I need to buy eggs, I’d rather use the store bought ones for baking than fresh eating. So I just keep holding off on baking or eating eggs. I suppose I’ll give in sooner or later. Or maybe the hens will be back on schedule soon. Is that too much to ask? This week I’ve worked at home a lot because I caught a cold and didn’t want to pass it on to my colleagues at the office. I’m so thoughtful, aren’t I? Working at home also means I can slip in little naps and lie-downs, too, which is helpful when one is feeling icky. Being cooped up in the house this much hasn’t exactly been a hardship, but I realized today that my solitary time at home is much more precious when its balanced by time out in the world. And today I went out into the world in a big way by going to Stitches Midwest. The main attraction was really to see my friends. Adrienne was spending the weekend at the convention hotel because she’s taking a class. Rachael, her mom, Jamie, and Krista were heading up just for the day to shop at the Market. I could have caught a ride with them, but I needed to run some errands in the area. So this morning I popped a Mucinex D and hit the road. I didn’t go to Stitches last year so it was the first time I’ve experienced it at the Schaumburg convention center. Very nice. And while a person may not be able to take the el out to Schaumburg directly, there’s a free trolley service that stops at the Convention Center and connects up to the PACE terminal, making it possible to get there and back on public transit. I had a budget in mind and Adrienne promised to help me stick with it. Walking around the Stitches Market its possible to lose control pretty easily. There are many, many books to browse and amazing yarns of all colors, weights, and fiber compositions abound. We walked around fondling and exclaiming over them all. And we totally lost our heads. As much as Adrienne said she’d help me stay on track, she couldn’t restrain herself this year. After being in the Market area for 6 hours and filling up her large Loopy Ewe shopping bag plus acquiring another to shopping bag full of yarn to boot, she barely pulled herself away from a skein of cashmere as we exited the Market floor. And me, how did I fare? Well…yeah, I blew my budget. I’ll own up to it like a big girl. It’s too dark to take photos but I’ll make note of the purchases now while they’re still fresh: a kit to knit Cia in Island Moss (green) KidLin ; a huge hank of un-branded sock-weight superwash (enough to knit a pair of socks for one of the Esalen workshop leaders, as promised! ); a pattern for a cardigan; a pattern for a wrap; a set of 3 funky ceramic buttons for a sweater I just finished; a pewter shawl stick; and a silk Lantern Moon bag. I made two major splurge purchases. At the Elegant Ewe‘s booth I spotted a rare find: a few copies of A Stitch in Time. I first heard about this book on the Cast-on podcast and was greatly intrigued. A book full of vintage patterns updated to work with modern yarns and in modern sizes, it sounded amazing. And it is. I wasn’t going to order it from the UK sight unseen, but browsing through the store copy today I decided it was well worth the hefty price of nearly $50. There are 56 patterns in the book and while I certainly wouldn’t want to knit all of them there are more than enough to make my hands itch to get started on one. I showed the book to Adrienne, who barely glanced at it before reaching into her wallet for the cash and sending me back to the booth to get a copy for her while she completed another purchase. My final splurge purchase was a sweater kit to knit Imogen. I’ve had this pattern on my wish list for years (no exaggeration) and Adirondack Yarns sold it bundled with Fleece Artist Blue Face Leicester Aran. I got a lovely, mottled, pewter gray kettle-dye. I suppose I could have purchased the pattern separately (I see they have it on Patternfish now), but this is a pattern that must be knit in a yarn with subtle color variations, and the Fleece Artist yarn fit the bill beautifully. I nearly bought the Lady of the Lake kit, too, but I restrained myself. I do have *some* control. But now I’m quite certain that I will cancel the bi-weekly cleaning service so I can get back on budget again. Because budgeting is all about prioritizing, right? And I’ll pick yarn over a clean house any day. Is that bad? For those interested just in “chicken stuff” I’m posting separately about the aftermath of the “raccoon incident.” In short: so far, so good. We’ve had 2 nights go by since the incident and no problems have occurred. Despite missing some tail feathers, Speedy seems to be doing well. I am now locking the hens up inside the Eglu run every night, even though it means physically relocating them each night from the top of the run where they’ve enjoyed roosting all summer long. I’d rather have my hens alive than just inconvenienced, and they will learn to go inside the run themselves in a few more nights time. A very kind neighbor stopped by yesterday and asked me what had happened. He lives on the other side of the alley and heard the racket that night. He grew up in a country and time where keeping hens in your backyard was not odd, so he’s a supporter of “the cause.” At his request, I gave him my phone number so he can call me if ever hears the hens kicking up a fuss again. I sleep on the opposite side of the house from the coop and have really well insulated windows. So unless they are open or the dogs (with their superior sense of hearing) alert me, I may not hear sounds of chicken distress right away. I’m glad to know he’ll call me if he hears anything amiss. For the past 2 days I’ve not gotten any eggs, but a disruption of the laying cycle is to be expected. I check the nestbox per usual and have found a messy glop of egg-like matter in there both days. I’m hoping that real eggs start showing up soon since I’m running rather low right now and want to do some baking. However, I do understand that the ladies lived through a night of terror with death staring them in the face (literally), so it will take them a while to get back to normal. Wasn’t that a Coca-Cola commercial at one time? I know it was from some sort of commercial, but I couldn’t resist the temptation to make it the title because I am refreshed. I don’t know if I feel all excited about heading back to work tomorrow, but I do feel pretty good right now. I gave myself permission to just relax this weekend and it worked. I ran errands on Saturday but I spent yesterday and today at home. And it really feels good to just kick back and be restful in my own home. Yesterday I had some friends over in the afternoon and into the evening, but not too late. None of my friends are late night folk these days. I prepared some cold salads and grilled some chicken, and we relaxed on the porch and just conversed. I also made a fresh peach pie for dessert and it was totally yummy. What’s made this so different for me is that I am not feeling stretched to make time for anyone else. As Erica Jong said in Fear of Flying, “Everyone wants to own their own soul,” and I had been feeling like that wasn’t the case. This being alone time is interesting. At times I’m very happy to be on my own and at other times I’m feeling mopey, lonely, and afraid. I guess that’s fairly normal, though. One thing I don’t feel is overwhelmed. I used to feel quite overwhelmed with running my life AND keeping the other person in it happy, whether that was my ex-husband or G. And it’s not as if either of them overtly asked for me to give up more of myself than I wanted to in a desire to make them happy, I did it anyway. So I have to learn from that so I can try to make it not happen again. I think I learned quite a bit about myself at Esalen and I’ve been holding on to that sense of knowing as much as possible. When was it that I lost the knack of living on my own? When was it that I thought it was necessary to be beholden to someone else: someone I would see or speak to every day or night? The days seem longer now, but not in an unpleasant way. I have more time back for me and I’m relishing every bit of it. One thing that’s likely now that I’ve sworn off dating for a while is that I will be writing more here on my blog. I think that’s a good thing. Today I’ve sat outside on my porch for hours, enjoying the moderate temps and the sunshine while alternately reading and knitting. I made time for few small chores in the house (a bit of laundry, some tidying/moving things around, watering the garden, and tending the hens) but otherwise I’ve just been incredibly self-indulgent. I feel so much better for it. More grateful, more centered, more refreshed. Thank you, universe, for a wonderful day. And there’s still more to come. Lovely. We had a visit from a raccoon early this morning. Luckily, all the hens are OK but it was pretty scary at the time. The dogs woke me up at about 4:15 this morning when they leaped out of bed and began barking. Then I heard the chickens squawking in distress. I threw on something suitable to wear outside and rushed out to the chicken run. I made the dogs stay inside just in case there was something out there I wouldn’t want them tangling with, like a skunk. When I first approached the run, I saw something on the fence along the alley out of the corner of my eye, but by the time I shifted my focus, there was nothing there. The hens continued to squawk in distress, but I couldn’t see anything amiss. I walked through the garden, around the back of the garage, and into the yard behind the house. Still nothing moving. So, I let the dogs out and went back to calm the chickens down. The chicken run. The raccoon was sitting in the tree just above. The dogs were going nuts dashing around the yard chasing scent trails. 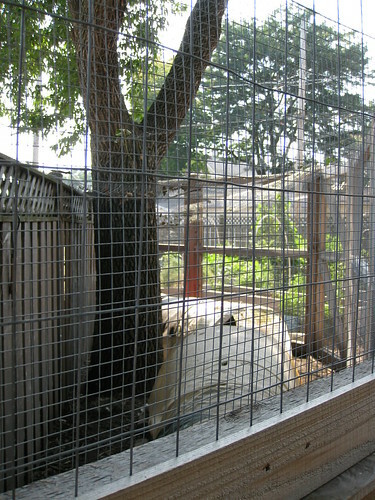 When I approached the chicken run this time, I finally saw the cause of their disturbance: a raccoon, calmly climbing along the tree around which the chicken run is built and settling into the place where the trunks converge. It seemed inclined to just stay there, and the dogs couldn’t do a thing to help. I couldn’t let them into the run, and even if I could, there is bird netting secured around the tree and covering the top of the run, making it challenging for anything to get in or out of the chicken run from the top. 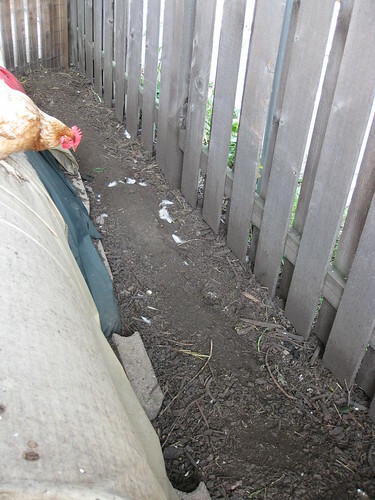 This bird netting — flimsy as it may be — is the only thing that saved my hens. It’s not stretched taughtly across the top of the run. Instead, it is draped and tied in a loose and floppy manner. I think that this made it too difficult for the raccoon to bite it’s way through, so instead it had to try to reaching through any convenient opening to grasp whatever it could find. I had to get rid of the raccoon, but I wasn’t sure what I could do. I looked around for something to throw at it, but nothing seemed suitable. So I pounded a bit on one of the posts and said “Get out of here! Go!” The raccoon obliged, climbing down the tree, down the fence, and then disappearing down the alley. I opened up the run and the stepped in amidst the paniced chickens, who were crowding along the doorway. I picked each one up and shoved it into an Eglu run, then secured the run door closed. Now if the raccoon came back they would be able to take shelter in the Eglu coop where it would impossible for the racoon to reach. I went back to bed, but it took a while to fall asleep. I was too keyed up and a bit afraid that I’m here by myself having to deal with this big, bad, ol’ raccoon with only a couple dogs to help. I slept an hour past sunrise, then got up to let the hens out of the Eglu into the main run. It was then I saw the evidence that Speedy had been in the clutches of the raccoon for a bit, at least. White feathers were scattered here and there around the coop. I recalled how Speedy had been separate from the other hens when I first approached the coop in the early morning’s racket. I looked inside the run and saw her hanging back a bit. Was she injured? I quickly grabbed her and checked her out. Near her tail I found a bare patch of skin where her feathers had been cleanly plucked out. There was no torn flesh and no bleeding, though she’s likely bruised. She was lucky. I have read in the Backyard Chicken Forums of chickens who’ve had legs and wings ripped off by raccoons. They grab whatever they can reach and can kill a chicken by tearing it apart. Since the weather has gotten warmer I’ve gotten lazier about locking up the Eglu runs at night. The chickens have taken to roosting on top of an Eglu run, where they find the air cooler and they can satisfy their desire to perch above the ground. After the visit from the raccoon, I can’t let them do this anymore. I’ve been keeping chickens for 3 years now and this is the first time I’m aware that a raccoon has come visiting. Now that one knows there are chickens here, I suspect it won’t be the last.